Jonathan Jones gets pretty lyrical about winter solstice and the ancient Orkney burial mound of Maeshowe, "with the astronomical spectacle of the sun piercing its dark sanctum of death." The BBC like lots of graphic locators (picture diagrams) reporting on the gathering at Newgrange in southern Ireland, older than Stonehenge, and aligned with the rising sun. 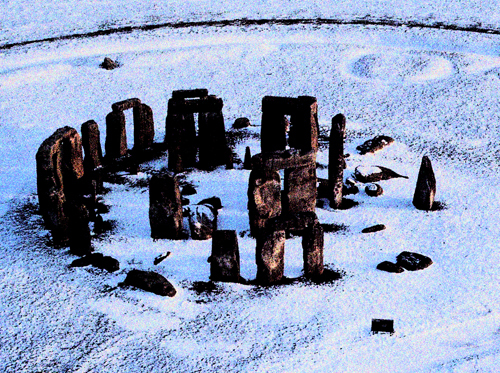 See lots of pictures of past winter solstice celebrations, from Stonehenge and Newgrange to Mexico and El Salvador at Huffington Post. At the Caught By The River site Katherine Venn presents a poem for winter solstice, Cam Ceiliog, inspired by the Welsh name for winter solstice, 'cockerel's step', but really I just want an excuse to eat the multicoloured tang yuan (glutinous rice balls in sugar syrup) for the Chinese midwinter festival Dong Zhi. Some Taiwanese turn their dumplings into protective talismans, sticking them to the backs of doors, windows or chairs, like some kind of evil spirit-repelling supergum. Actually, that sounds pretty good, but eating them is still better.